Instructor to get you airborne! 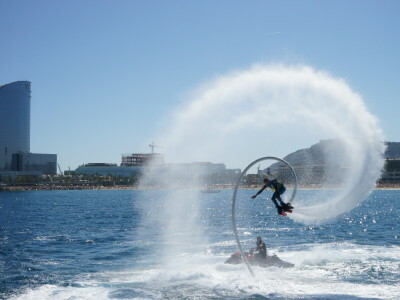 The Coolest Water Activity Ever! 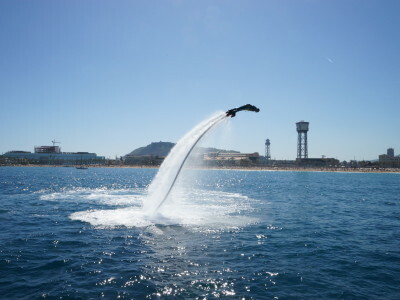 Give your girl’s hen do in Barcelona an unexpected twist with a session on a flyboard, the craziest water jetpack out there! 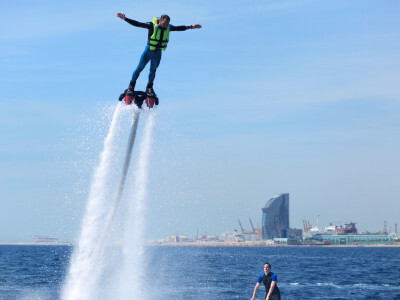 With powerful jets under her feet which propel her out of the water, she can give her best Wonderwoman impression as she flies through the air at heights of up to 15 meters! 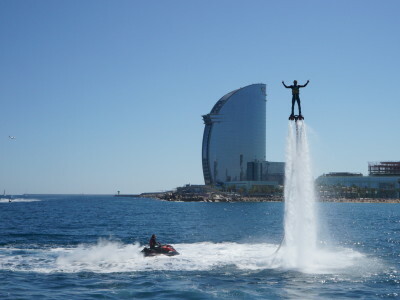 The adrenaline and speed is awesome, and watching your hen fly majestically through the air is a unique, unforgettable experience! With your own instructor too, you will learn to fly in no time. So go ahead, give your hen something crazy she will never forget on her big weekend! If you are looking for additional time, not a problem. Get in touch with us to discuss how we can upgrade your hen’s package to a 30 minute or 1 hour slot! We take care of the equipment, insurance and your valuables so you can focus on the fun! If your stag likes an audience, you can bring along up to 10 additional friends to watch the activity from the boat for a small additional fee. It is also necessary that everyone participating in the activity must know how to swim!